Split in one tyre (that would be the unavoidable pot-hole due to oncoming traffic a few weeks back), a hole all the way through another and the third tyre was just on the legal limit of mms of rubber required. The fourth was fine! I’d only popped in to the tyre shop to get my tracking checked, which not surprisingly was off. My vehicular traumas however are not the topic of this blog. Rather, it was just where I wrote it, two and half hours for above said work to be done, wifi, coffee, unexpectedly became a perfect environment for my morning’s business activities. The service I received was exceptional, I was shown the damage, not just told about it and taken through the tracking checks. Kept up to date all the way, treated like an individual and regularly refuelled with coffee. Pretty standard practice I hear you say, but is it? Really? Always? Whilst pondering an imminent meeting, I suddenly became aware of the television in the corner of the room, it had obviously been in the reception area and on all morning however I hadn’t noticed it. Denny Slagle, the CEO of Mack was speaking about teamwork, people and what makes Macks special. He was also talking about being part of something that is bigger than yourself, what’s important and making a difference. Mack’s are American trucks (although now owned by Volvo), just as you might imagine an American truck, big, very big, brash, fabulous engines with lots of torque and horsepower and with a formidable sort of presence about them. What captured my attention though was the sheer passion and enthusiasm of the Mack employees to get these vehicles out on the road in superb condition, efficiently and effectively. And if something was looking unusual or irregular questioning it. Moreover, the individuality with which all the employees were treated was something else, an exemplary leadership standard if ever I saw one. Some of the employees were experiencing tough times for one reason or another but for sure there was a fantastic support network in the company. People didn’t appear to ‘just’ go to work at Mack trucks, there was a greater importance attached to people’s lives and their communities and delivering excellence through a combination of skill, determination and hard work. Branding is talked about constantly however the branding that shines forth beyond the Mack truck and indeed STS in Letchworth goes way beyond the corporate colours. It’s about integrity, resilience, happiness – perhaps qualities that can’t be put on a badge however the strength of feeling and commitment associated with them is immense. I’m not really in the market to buy a big American truck (funny that) but on the strength of the passion, dedication and enthusiasm I spied this morning, I’m tempted! I was very honoured to be at a school last week where the headmistress gave a talk which I was quite taken by. Not once did she talk of academic prowess which she could very easily have done, grades or league tables but of the importance in our schools to teach children about thosethings that aren’t on the curriculum namely resilience, happiness and the ability to ask questions. How fantastic, after all, these are the qualities that will mean the difference between moving ahead or not when life’s challenges appear, be it a difficulty on a production line, corporate challenge or something intensely personal. On a final note, the gold-plated bulldog. 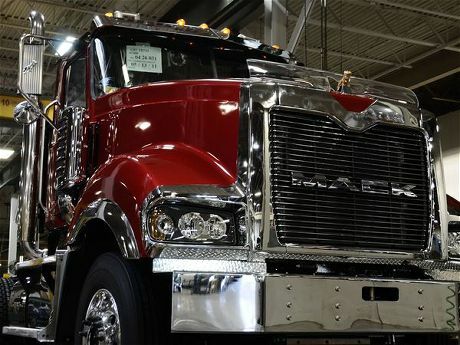 If a Mack truck has entirely Mack parts the badge is gold-plated, if other manufacturers have parts in the vehicle the badges are merely chrome! Is what you stand for gold-plated?